It’s no secret that more users are starting their search for products and services from mobile devices. A recent report from Hitwise analyzed data from a large pool of web searches and found that almost 60% of them began on mobile devices. Google has been pushing its “mobile first” mantra for a few years now and announced their mobile message extension in late October this year. Now the extension option should be appearing in most Adwords accounts. 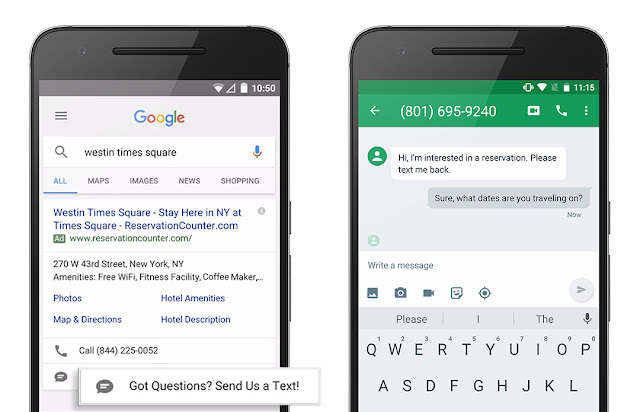 The extension allows users to contact advertisers via SMS text right from search results – similar to call extensions. Speed: With more and more searchers making their first contact on the go, this provides a quick way for users to make that first contact. Now they will not have to complete a form or potentially wait their turn in a phone queue to get in touch with your business. Convenience: Message extensions allow a potential customer to initiate and continue a conversation at their own pace instead of requesting a scheduled call to discuss their needs. Accessibility: Businesses do not like to miss out on a potential customer or lead just because they appeared too busy for that first contact. Message extensions demonstrates to your users that your staff is flexible and adaptable to how they are contacted. From the Ad Extensions tab, create a new Message Extension at either the Ad Group or Campaign level. You will then see this pop up (field descriptions below). Extension text (35 characters): This text will appear next to the extension in the ad. Follow general guidelines so your message is clear and users understand that by clicking the ad, they will be sending you a text. Message text (100 characters): This is the default message text that will appear in the user’s messaging program. Think about this carefully. Set it up so it starts a clear conversation with the person on the receiving end. Just like with other ad extensions, conversion tracking is not currently supported. We will discuss some workaround in a future post. Let us know about your experience with message extensions or questions in the comments.